"An eagle!" my soldier yells. "Look out! Help me!" My men, who I've seen stand fast in the face of overwhelming machine gun fire, are scattering because of a dive-bombing bird. The eagle circles overhead, taunting me before swooping down and raking its claws across my arm. Just as I start to recover, an enemy patrol drives by and spots us shooting into the air. They decide to join the party, aiming at us briefly before a rhinoceros slams into their truck and throws them over a cliff. And that's when the mortar fire starts raining down on our heads. Aimed at me? Aimed at my fellow soldiers? Aimed at the eagle? I don't even know anymore. Welcome to Far Cry 4. Listen, if I could take my review of Far Cry 3, cover it in snow, strap it into a wingsuit, and then copy and paste it into this spot, I would. Were you a fan of Far Cry 3? 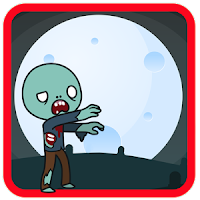 Did you find it exhilarating to climb radio towers, "liberate" outposts with hot lead, stab a few animals to turn their skins into new items, and generally cause mayhem? Did you enjoy doing these actions in an easy, consequence-free sandbox without the strain of Far Cry 2's realistic malaria simulation ticking in the background? That's great, because Far Cry 4 is The Hangover 2 of video games (except Far Cry 4 is actually entertaining and The Hangover 2 was a massive disappointment). 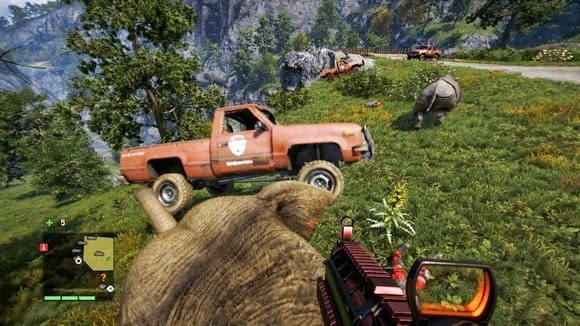 Take everything you love about Far Cry 3, put a different name on it, retexture it, and voila! 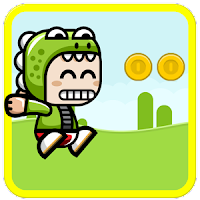 Brand new game. Climb bell towers, liberate outposts that are Nepalese instead of tropical, fight against Pagan Min instead of Vaas, and murder Tibetan wolves instead of jungle wolves. Even the story hits the same general beats. You're an American dude, Ajay Ghale, trying to spread his mother's ashes in Kyrat. The catch, of course, is that Kyrat is under the oppressive thumb of one Pagan Min, the pink-suit-wearing dictator who cares more about blood on his shoes than human lives. The overarching story is bland "liberate this country" schlock, made even worse by the fact that we've literally played it twice over already. It's not out-and-out as condescending as Far Cry 3, but in some ways it makes even less sense—you voluntarily traveled to a war zone and then... what? Became a revolutionary leader? All you were trying to do was deliver your mom's ashes! That central through-line is lost so quickly that every time the game brought up my mom's cremated body again I'd literally go, "Oh right, I forgot about that." 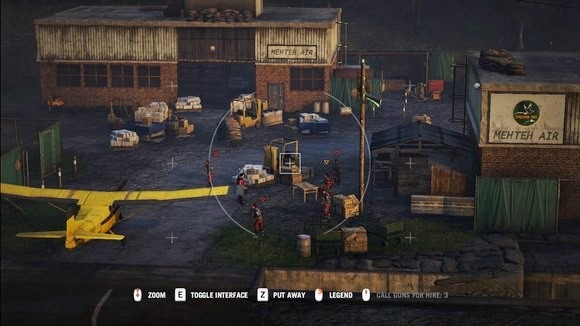 Ubisoft tries to broaden the story a bit by adding in some choices along the way, which slightly change your mission objectives, but this is a by-the-numbers story. I want to give Ubisoft Montreal credit though—while the writing in Far Cry 4 on a macro level is terrible, the team is phenomenal at writing characters. 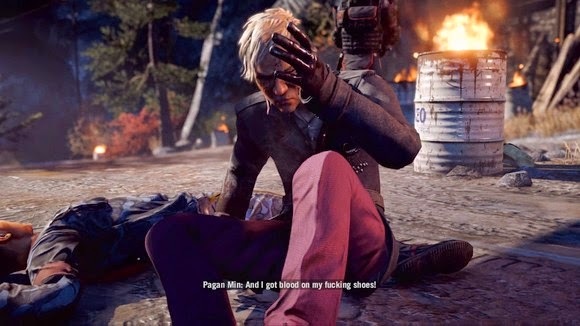 Far Cry 4's Pagan Min and Far Cry 3's Vaas are different characters, but they capture the same frenetic, charismatic absurdity. There's something so logical about everything they say, even though it's a twisted and demented logic. Far Cry 4 sweetens the deal by adding three second-in-command characters that are every bit as crazy as Min himself. The strong writing extends to your side of the conflict too. Longinus, for instance, is a weapons salesman who believes when Jesus returns to the world he'll need guns to set things right, while Far Cry 3's Hurk returns to try and appease the monkey gods. It's all very silly and entertaining on a moment-to-moment level, even if the broader story strokes don't make a lick of sense. And the story doesn't really matter. It's a flimsy framework for an adrenaline-pumping survivor story. Far Cry 4, like its predecessors, is a weapons showcase. It's that cold feeling as you circle an outpost, tagging enemies with surgical precision before whipping out a silenced sniper rifle and taking them out one head-shot at a time. Or it's the clenching of your stomach as you silently crawl through an enemy village, disabling alarms and leaving slit throats in your wake. Or it's the utter stupidity of crashing through a gate on the back of an elephant, a grenade launcher in hand to deal with any enemies that haven't already been snagged by your ride's grasping trunk. That feeling of systems-driven chaos is still here, playing Far Cry 4, and it's enough to carry the game through one more go-round. There are some other small changes. You get a wingsuit early in the game that functions as a go-anywhere hang-glider, there's a janky Mad Max-esque gyrocopter to fly around in, and you can (as mentioned) ride elephants. There's also an overwhelming amount of side content: assassination missions, hunting missions, armed convoy escorts, and more. Most are pretty rote, with "go here and shoot this" describing the extent of almost every mission. 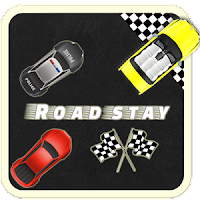 Where you're going is different and the method of execution is different, but the side content is still the weakest part of the game. Some of your leveling perks are locked behind completing a certain number of these missions, so you'll have to do some in order to (for instance) unlock unlimited sprinting. Otherwise, they're there to complete—or not—at your leisure. Honestly, though, the game is 95 percent the same as Far Cry 3. That's not a bad thing yet. I had fun taking down another 24 outposts, climbing another 17 bell towers, taking out another murderous dictator, and blowing up anything that moves. 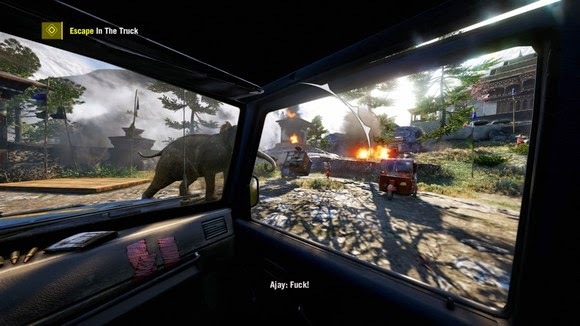 There's a feeling that anything can happen in Far Cry 4, as long as it's anything that involves the use of a gun. It helps that Ubisoft's Nepal is gorgeous, with sparse grassland and autumnal landscapes stuck in the shadow of the massive snow-capped Himalayas. You don't go up to those Himalayas often, but doing so is fodder for some amazing Shooter fan fiction. I don't think I want Far Cry 5 without some major changes, though. I don't want another thirty hours of this, but in another realistic place with another charismatically crazy dictator. I loved Far Cry 3: Blood Dragon in part because it was the same Far Cry mechanics in an inventive location—hell, if Blood Dragon 2 existed, I'd take it in a heartbeat over Far Cry 4. 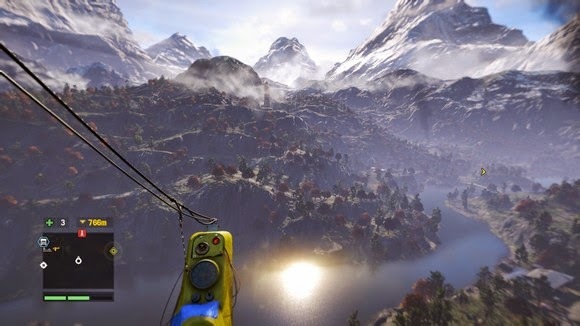 Far Cry 4 is fantastic, if familiar. It's the warm embrace of a game you've already played, back to bring you more. If you enjoyed Far Cry 3, you'll have fun with this. 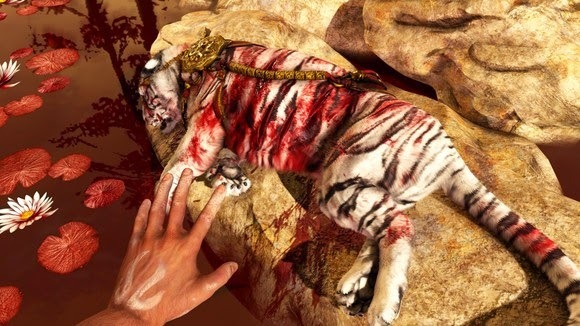 If you're one of the Far Cry 2 faithful that considers the sanitized, simplified thrill ride of Far Cry 3 blasphemous, this isn't going to bring you back into the fold. It's that simple.